I have written before that in many ways being a Catholic is the way I hold the tension between my Protestant and Orthodox proclivities. In no way is this truer than when it comes to pondering the depths of human sinfulness, that is, our collective and individual estrangement from God. This is why the witness of the saints is so very vital for me. The saints give me hope, even as I realize that in the end the Church of Christ is made up only of the saints. My hope arises from the fact that, by-and-large, the saints are those who were willing to engage in the struggle, the agon, as St. Paul referred to it (Yes, the word from which we derive "agony"). It is easy to forget something that Sacred Scripture teaches: "our struggle is not with flesh and blood but with the principalities, with the powers, with the world rulers of this present darkness, with the evil spirits in the heavens" (Eph. 6:12). Stated succinctly, our struggle is against evil, manifest in each of our lives as sin. As is also set forth clearly in Scripture: "If we say, 'We are without sin' we deceive ourselves, and the truth is not in us. If we acknowledge our sins, he is faithful and just and will forgive our sins and cleanse us from every wrongdoing. If we say, 'We have not sinned,' we make him a liar, and his word is not in us" (1 John 1:8-10). It seems to me that individually and collectively we expend an extraordinary amount of effort finding ways around these truths, one of the many ways we try to reduce God to our own measure in order to let ourselves off-the-hook, as it were. But it also has the effect of reducing Divine Mercy, which is a sacrilege. All I have to do to verify that this is true is to contemplate my own heart. It was interesting, along these same lines, to read some of the reactions to Dr. Ralph Martin's book, published earlier this year, which merely restates what the Church has always taught, something reinforced, not done away with, by the Second Vatican Council: Will Many Be Saved? : What Vatican II Actually Teaches and Its Implications for the New Evangelization. To wit: if you ain't a sinner, you don't need a Savior and Christianity is rendered incoherent. St. Paul begins the earliest Christian creed that has been handed on to us with, "For I handed on to you as of first importance what I also received: that Christ died for our sins in accordance with the scriptures" (1 Cor. 15:3). In the Letter to the Hebrews, on which I am currently leading a parish Bible study, we find something similar towards the beginning: "When he had accomplished purification from sins, he took his seat at the right hand of the Majesty on high" (Heb. 1:3). The missionary mandate given by Christ to the Church, known as The Great Commission (Matt. 28:19-20), to take the Gospel everywhere to everyone remains as valid today as ever. Homo curvatus in se, "man curved in on himself" is how St. Augustine described the unjustified human condition. Sticking with this image, Christ comes to straighten us out, or, perhaps more accurately, bend us outward. Simul iustus et peccator is how Martin Luther described the justified man, who is simultaneously justified while still a sinner. Think of St. Paul's "But God proves his love for us in that while we were still sinners Christ died for us" (Rom. 5:8). Consider also the whole phenomenon of our post-baptismal proclivity to go on sinning, which necessitates the need for the Sacrament of Penance. I believe it was Archbishop Sample of Portland who noted on Divine Mercy Sunday this year that the Sacrament of Penance was the first gift Christ gave to His Church after His resurrection. I am currently making my way through Franz Posset's Pater Bernhardus: Martin Luther and Bernard of Clairvaux. Eventually I hope this will bear fruit and allow me to further some thoughts I shared in "Discipleship costly for all who follow." Especially after reading Christoph Cardinal Schönborn's treatment of Luther's understanding of justification exactly a year ago in his book God Sent His Son: A Contemporary Christology, I have been trying to determine how Augustianian I can be with regard to human sinfulness without falling into Lutheranism, or the very tempting, but philosophically and theologically inadequate, Calvinistic doctrine of total depravity. 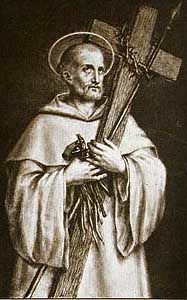 While I found Cardinal Schönborn's comparison of Luther's doctrine of justification with that of St. Thomas Aquinas useful and informative in this regard, I find Posset's more apt because Luther, who was steeped in monastic theology, as opposed to scholasticism, tended to look to St. Bernard and not St. Thomas and the schoolmen, whom he held in contempt because he felt they viewed Scripture as secondary and not primary. "Self-centeredness," Posset writes, "is the essence of curavtio of the warped soul. In this regard Bernard and Luther thought alike." As Bernard viewed the matter, Posset continues, "evil stems not from the body, but from the heart." He goes on to suggest that "[t]his idea may also have rubbed off on Luther." He notes that in Luther's lecture on one of the passages above, 1 John 1:10, Luther "spoke of human beings as carrying 'a monster in our flesh', which may echo the bernardine brutus and bestialis spiritus." In his lecture on this verse from 1 John, Posset continues, "Luther declared that we are weakened, not only by fleshly sins, not only by the fervor of libido, wrath, false wisdom, by also by carnal affect which flees hope and faith; and that we are always inclined to wrath, which is graver than any in the flesh." What is more striking to me is Luther's insistence, in light of our inclination towards wrath, is the human "tendency to seek a remedy on [our] own." While there may be differences between Bernard and Luther about the depth of human sinfulness, both believing that it runs rather deep (as Posset summarizes it, in his 82nd sermon on the Song of Songs, Bernard "reflected on whether man resembles more God or a beast"- St. Bernard is a Doctor of the Church), they agree that there is only one remedy for what afflicts us: Christ Jesus crucified and risen. However, there remains the constant temptation to give into antinomianism, which, as defined by Merriam-Webster, refers to "one who holds that under the gospel dispensation of grace the moral law is of no use or obligation because faith alone is necessary to salvation," which is contrary to Scripture, not least of which because it reduces "faith" to mere belief and one that does not move us. "God calls you to make definitive choices"
"They like to get you in a compromising position"
"They say time takes its toll on a body..."
Truth: "a question of...deep memory"